Located right on the central of main pop street (Sivatha) , Old Market (Phsar Chas) area, is easy access and close to the tourist attraction zone such as Angkor Wat, National Museum, all night clubs, restaurants, gift shops, mini-marts around Phsar Chas (old market area) and public transport situations. Just walk for 2 minutes to Angkor Swiss Center or 5 minutes to the Old market and 15 minutes drive to the International Airport. This hotel was known as a comfortable wooden Khmer house building, designed to build, equipment and furnish all in woods. 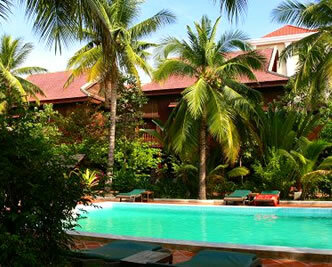 We have 47 wooden rooms with private International bathroom and wooden balcony over look to swimming pool and garden.